Do you want your students to engage with and retain psychology’s key principles, and to work toward becoming better students and better people in the process? 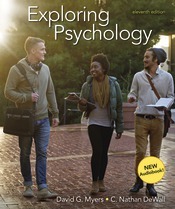 Best-selling Exploring Psychology offers creative ways to help make it happen.The new edition of Exploring Psychology offers outstanding currency on the research, practice, and teaching of psychology. Myers and DeWall inspire students with fascinating findings and applications, effective new study tools and technologies, and a compassionate and compelling storytelling voice. Their presentation is based on the same guiding principles that made David Myers the world’s bestselling introductory psychology author. Facilitate learning by teaching critical thinking and helping students at every step. Present psychology as a science, emphasizing the process of inquiry and putting facts in the service of concepts. Make sure students come away with an appreciation of psychology's big ideas, and with a deeper respect for humanity--what drives us, distinguishes us, unifies us.